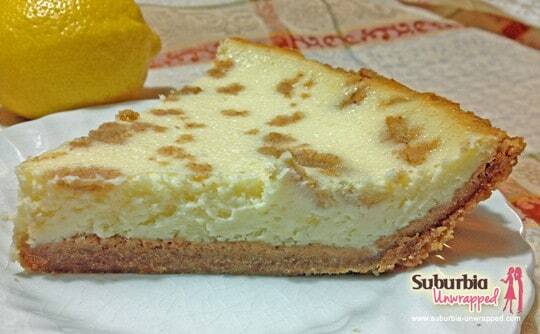 On Friday, my daughter made this Lemon Cheesecake Pie as part of her Girl Scout Troop’s Bakeoff competition. The rules stated that the pie had to be made completely by HER with no help from mom. You have no idea how difficult this was! I wanted to be in the kitchen hovering and micromanaging to make sure that it came out perfectly. Well, she did an awesome job and the pie came out delicious however she spiked a fever the next day and couldn’t participate in the bakeoff. She was sad but enjoyed the experience of cooking by herself regardless of the outcome of the contest. I thought I would share the recipe with you, although I have absolutely NO idea where it originally came from. We were emailed the recipes from the troop leader and had to pick one to make. You could just buy a premade graham cracker crust to use but making it from scratch was very simple! Make the crust: Combine graham cracker crumbs, butter and sugar in a bowl, mixing well. Press by hand into 9-inch pan. Bake at 350 degrees for 8 minutes. Reserve 2 tbsp of mixture to sprinkle on top of pie before baking. Cream the cream cheese and butter. When soft, add sugar and egg. Mix well. Bake for 35 minutes at 350 degrees. Chill before serving. That looks delish; saving this for future use! Thank you.